Something that always struck me about Anchor Brewery of San Francisco: it never made huge efforts to associate its star brand with the pre-Fritz Maytag brewery, or California steam beer in general. Fritz Maytag, of the famous washing machine family, is a legend in the beer business. He rescued Anchor from the edge of bankruptcy in 1965 and placed it on a solid financial and quality footing. This helped finally to kick-start the craft brewing movement on the West Coast and ultimately everywhere. Anchor has an unquestioned status as craft brewing avatar. Still, I feel the company has been somewhat equivocal about steam beer history and the extent to which it continues the tradition. To be sure, Anchor explains its history and heritage proudly on its website. It notes the brewery has functioned under its present name since 1896 and has made steam beer since then, and some information is given on historical steam beer practices. “The word ‘steam’ may have referred to the pressure of natural carbonation developing in the beers. Today the brewing methods of those days are a mystery, and for many decades Anchor alone has used the quaint name ‘steam’ for its unique beer. 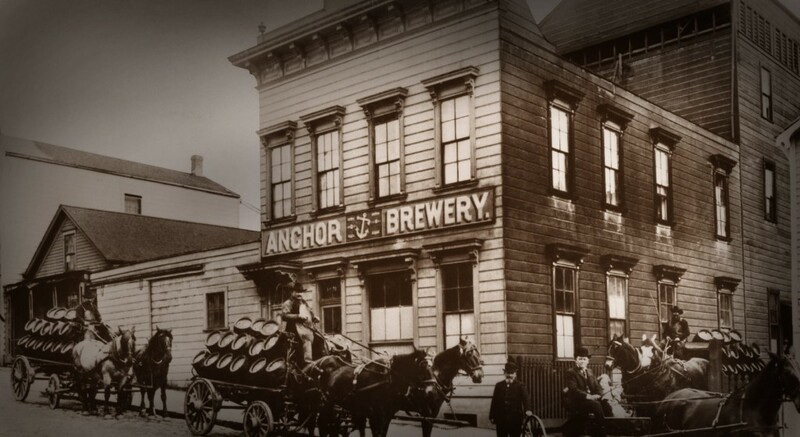 Today Anchor is one of the smallest and most traditional breweries in the world. San Francisco’s famous Anchor Steam beer is unique, for our brewing process has evolved over many decades and is like no other in the world”. As one sees, Anchor considers the brewing methods of steam beer’s classic era, approximately 1850-1919, “mysterious”. An explanation is offered for the name steam but Anchor doesn’t commit to the story. Indeed the website suggests another possible origin, steam rising from wort fermenting on the rooftops of old Bay Area breweries. I find this persuasive, myself. By saying Anchor Steam is “unique” – twice – and like no other beer in the world, the brewery is marking its beer off from all others, but also to an extent from steam beer history. I offer some suggestions below why Anchor has taken this approach. But first, what was steam beer in the heyday mentioned? We have a fairly good idea from a number of articles or passages in books written around 1900. This article, from the December, 1903 American Brewers Review, gives a detailed account of California steam beer production. Some highlights are, use of lager yeast to ferment in the temperature range for ale or top-fermentation brewing; an all-malt character but with some brewers opting to include grain adjunct or sugar; use of black malt or caramel to give an amber cast to the beer; fermentation in shallow pans with an initial fermentation in “starting tubs”; hopping at about 3/4 lb per barrel of wort; use of hops from the West Coast; and use of local malting barley. The account states that for brewers without refrigeration equipment the wort was cooled in cooling equipment which was, as other accounts of steam beer breweries make clear, located on the top floors of the breweries. These often had shutters to control in a primitive way air flow and temperature. The louvers can be seen in the image of Anchor Brewery above, from 1896. Malting barley often used in California then was a particularly prized six-row type called Bay Barley, it was said to have plump kernels and similar to fine, European-raised two-row barley. Hops then, as California still had active hop culture, was a Cluster type. Cluster apparently derived from a cross-breeding of wild American hops and a variety(ies) brought from Europe by British or Dutch settlers. In 1903, much steam beer was krausened as well, meaning some freshly fermenting beer was added to clarified, fully-fermented beer to make a final, strong carbonation and add a fresh note. So that was then, for steam beer generally. How is Anchor Steam brewed today? The company uses 2-row pale malt as the base, and some caramel (darkish brown) malt to ensure a medium amber and a little sweetness. The hops used are (the hybrid) Northern Brewer, at about one pound per barrel of beer, which would offer a combination of old and new world hop tastes, as Cluster did. Today all Anchor Steam Beer is pasteurized, however a flash process is used that is felt less impactful on the beer than the more intensive tunnel process. Cooling the wort the modern way and even flash pasteurizing are simply ways to better ensure a beer’s stability. They don’t alter the character of the beer in any meaningful way. 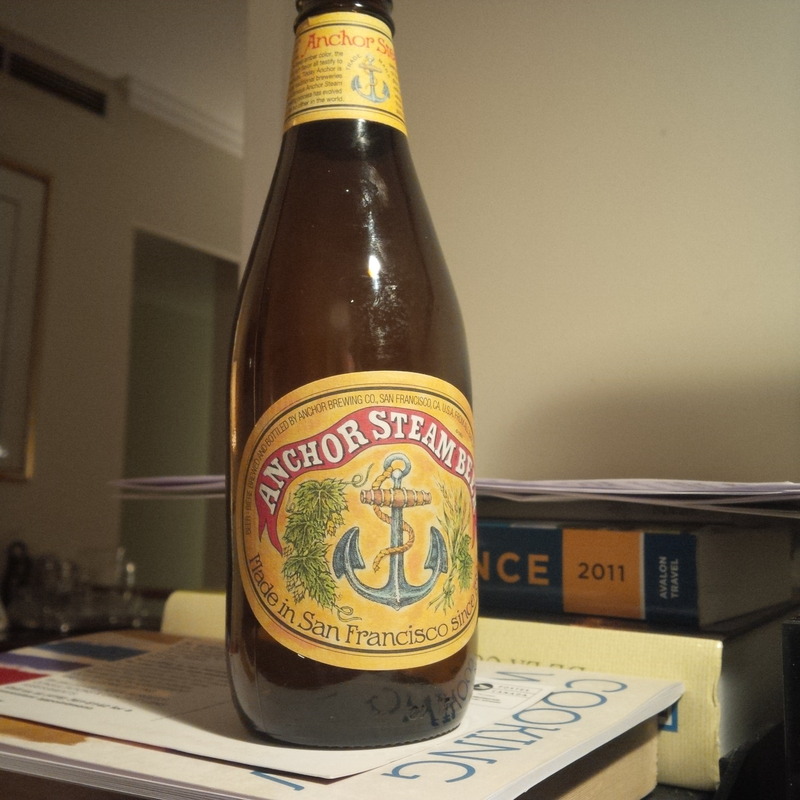 My view is that in every important respect, Anchor Steam Beer reflects classic steam beer tradition. The beer has the expected, slight aleish quality (fruity note) from a warm ferment but the roundness and clean quality of a lager beer. It is all-malt and uses a hybrid hop, as much steam beer around 1900 did, etc. 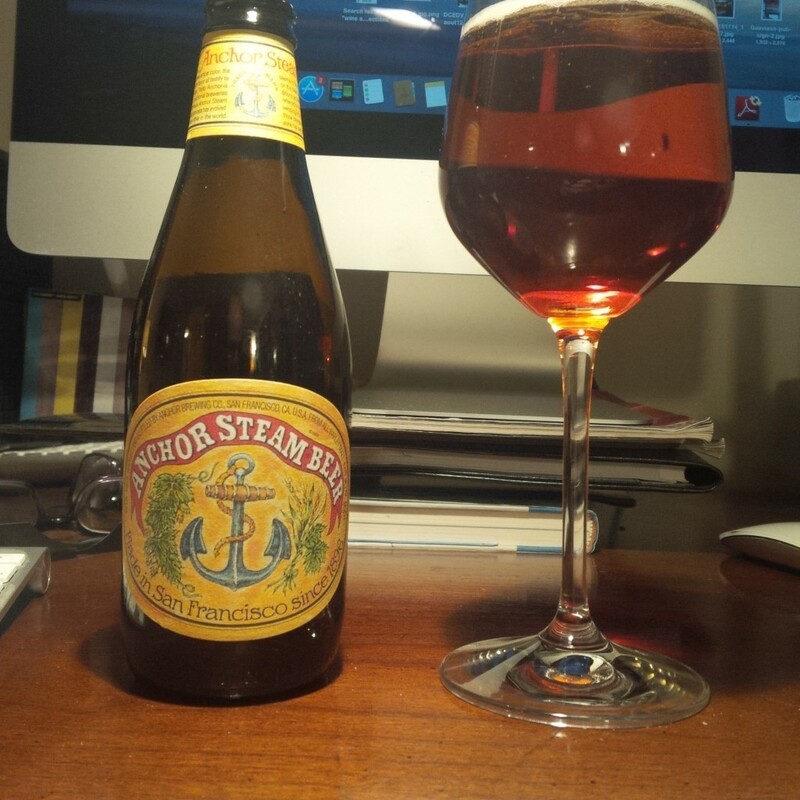 Therefore, Anchor Steam is probably quite similar to much of the steam beer available before WW I. Since most breweries then used wood vessels, which are hard to clean, some steam beer had unusual tastes. One surviving report, reprinted on Jess Kidden’s historical beer pages, called the taste “wild and gamy”. This may have meant some steam beer had a Brettanomyces, or “animal”, note or possibly a sourish edge from lactic acid bacteria. The 1903 article linked above likens the taste of steam beer to “weissbier”, of which some styles are sharp and lactic in taste. Anchor Steam Beer does not have those tastes, but I’d think the best of the original steam beers were similar to today’s Anchor Steam. Why then would Anchor distance itself from early steam beer history? One answer is clear and understandable, something Fritz Maytag has discussed in interviews many times. When he bought the brewery the beer was inconsistent. Often it would go sour and bar owners were hesitant to stock a beer which was not reliably stable when sold. Also, due to the straightened finances of the previous owner (from c. 1960 Lawrence Steese, and Joe Allen before him), sometimes sugar was used in the mash to reduce cost. Whether by 1965 hop content had fallen from historical levels, see the 1903 article mentioned, is unknown to me. In any case today Anchor Steam uses the aforementioned one pound hops per barrel. This is well within the historical range, in fact 3/4 lb per barrel of wort (unfermented beer) might equate pretty closely to 1 lb hops/bbl after evaporation and process losses. Also, the brewery back in 1965 was so small and faltering it had almost no fan base, certainly no cachet. Quality had be addressed to make the brand saleable and Maytag did so, not just in the changes noted but by buying new equipment, improving sanitation, and finally moving the brewery to a new, purpose-built location. He therefore focused on these factors as explaining the brand’s appeal rather than the romantic but variable, earlier history. So far so good, but after a few years of success I’d think many breweries would link their product more directly to their early history or at least, to the beer style in question. Anchor didn’t, though, as brewery spokesmen have always been non-committal when asked what steam beer was. Typically they have stated no one really knows today, and as we are the only ones who sell a steam beer, a beer that evolved in our particular way, steam beer is what we make. This ties steam beer, the style, to Anchor Brewery. The name Anchor Steam Beer was registered in 1981 as a trademark as no other brewery had used the name steam beer since the 1930s. So indeed Anchor’s steam beer is the only one in the world in that sense. One can ponder whether product uniqueness based only in part on a vague historical character made the legal argument to gain a registered trademark more acceptable. “Steam beer”, once a descriptive term for a style made by many breweries in California had become distinctive in Anchor’s hands as it was the last company standing to use it when the trade mark was granted. It’s a good argument, if that was the strategy from a trade mark viewpoint, as no other company has been able to market a steam beer since. At the same time I consider Anchor’s beer firmly within the frame of early steam brewing. In other words, I think Maytag did want to restore his beer to the best of early steam beer tradition but, understandably from a business viewpoint, made a (hitherto) successful argument that only his company can use the term steam beer. Final note: how does Anchor Steam Beer taste today? It tastes great particularly on draft in California or from a fresh bottle. Current bottles at the Liquor Control Board of Ontario are vibrant with sweet malt, a light estery (fruity) quality, and flowery hop taste. I’ve been drinking it off and on since the 1970s and it has never been better. Note re first image above: The image shown of the Anchor Brewery, from 1896, was sourced from this website (www.thehoppyhour.com) and is believed available for educational and historical purposes. *Further reading confirms that Anchor pitches its yeast at 60 F, similar to what c. 1900 sources specify for steam beer. This is important as much of the steam beer character derives from lager yeast being used, atypically, at warm temperatures. **Note added May 2, 2018. Text was lightly edited to sharpen the focus and reasoning, but nothing essential was changed from the original posting. Also, Anchor Steam Beer on draft is now available in Ontario, I had it last night at beerbistro, a bar-restaurant on King Street just east of Yonge Street. Anchor Brewery was sold to family-owned but sizeable Sapporo Brewery of Japan a few years ago. Sapporo also owns Sleeman Brewery in Guelph, ON. As far as I know, the Anchor Steam draft in Ontario is from San Francisco, but if it is or will be made at Sleeman, I’d have no objection. Beer can be replicated anywhere now with today’s technology. Well I guess that anchor should offer a real idea of Steam Beer .There is enough information to replicate a steam beer from the 1880 s.Not just a beer that they think will sell and call it A steam beer.Just a thought . I see what you mean. I think in their heart of hearts though, they might say, ours is an authentic 1800s steam beer, so we don`t need to formulate one again. I would be very interested in how someone with a background in Law perceives the branding of a once common heritage. Hi Doug. I’m not a specialist in trade mark law, and U.S. trade mark law has some differences from ours too, so I can’t really offer any very useful thoughts. I’d guess Anchor argued that what was once a descriptive beer type lost that status since the industry hadn’t made the type for many decades except for them (Anchor). The trade mark office there must have agreed because it did issue a trade mark for Anchor Steam Beer I understand. Its true that other companies in the States at any rate (not sure about Canada) can’t call their beer steam beer, but Anchor would say, to the extent anyone knows what steam beer is, it’s because of us, so that’s not unfair. Part of the problem too is the name California common, as an alternate, is kind of unfortunate, a more zippy name might make it easier to place on a label and (in effect) compete with Anchor. If someone really wanted to get into the market I am sure they could come up with a creative label but which keeps them on the right side of the law.